The meeting, which was facilitated by CGCC and focused on East Africa, was the third regional workshop in a process that included a series of meetings to discuss the risk of terrorist abuse of the nonprofit sector and to share good practices and foster cooperation in responding to that risk in different regions around the world. The meeting was convened under the auspices of the UN Counter-Terrorism Committee Executive Directorate. 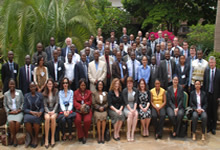 Participants included representatives from international and regional organizations active in this field, national-level officials with a role in counterterrorism financing or charities regulation, and representatives from the nonprofit sector from across East Africa.